I woke up at a time that started with a 6. Not my favorite thing to do. It turned out I didn't need to be there as early as I thought, but I was more than on time for my all-day workshop with Cheryl Arkison, blogstress of Dining Room Empire and co-author of the GREAT read Sunday Morning Quilts. She'll have another book coming out in August, too. During the middle of the day was the awards ceremony where my little Frost Bank mini quilt got Honorable Mention in its category. Seriously. A ribbon. 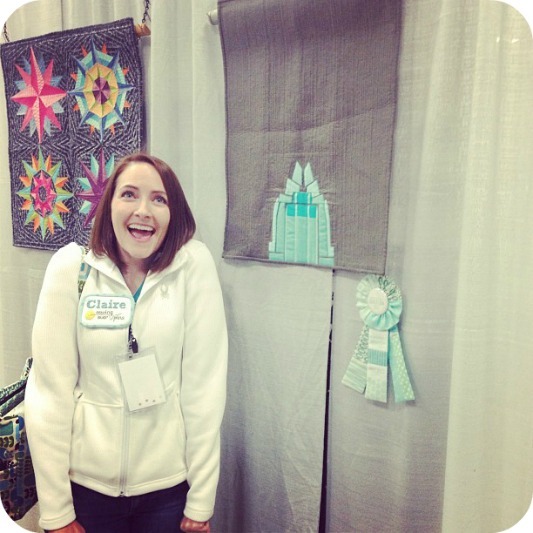 I was so pumped to have a quilt in the show, and to win one of two prizes in the category was a HUGE shock. Some family and friends who work downtown sweetly surprised me by visiting during their lunch break, and I got to show them around the quilt show a little bit. 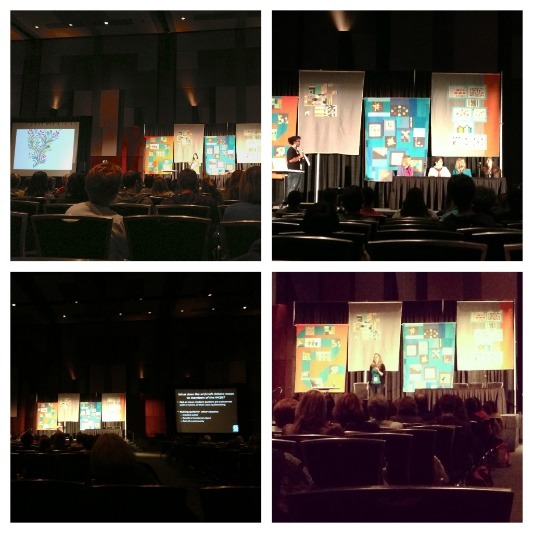 It's so awesome to have QuiltCon in Austin so I can share the quilt world with them! I grabbed a quick bite from the concessions stand before going back to class. I ended up eating my lunch in the balcony seating area by Jay McCarroll from Project Runway who taught some classes during the conference. I was tired by the time the Perfect Circles workshop got out at 5pm, but I grabbed dinner with the Austin Modern Quilt Guild President before we headed to the MeetUp for MQG Leadership. Since I'm the VP of Programming for the Austin MQGuild, that means me, too. It was phenomenal talking to other guild officers and hearing about their meetings and their guilds. It's amazing how the names you know in the quilting world are actively fostering community by volunteering their time and effort into all it takes to keep a guild running. It's a good reminder that these folks who have SO MUCH going on are also keeping the machine running. I was surprised to hear from the people I spoke with that 40 members is a big number to have at a guild meeting. The Austin MQG regularly has that kind of turnout, and finding a good meeting space for us is TOUGH. Of the people I discussed this with, only Vancouver and Kansas City had more. I'd love to hear how many people are at your guild meetings. 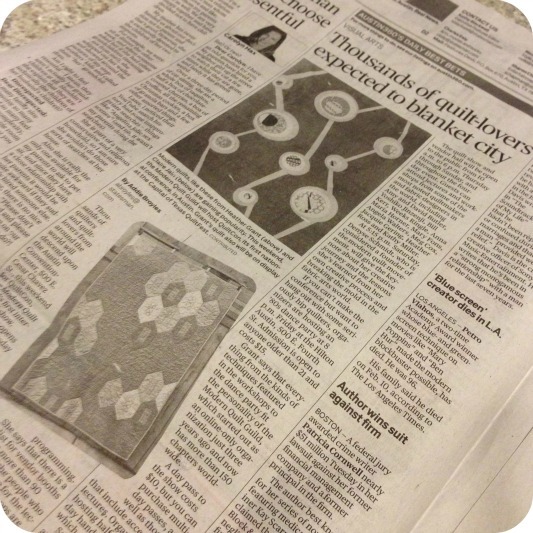 I was wiped out when I got home, but excited to find out from a neighbor that a photo of my Marine Den quilt had been in the paper along with one from Heather Grant at Modern Day Quilts (who's been working on QuiltCon with MQG for the last year and some change). I was still drained and had a hard time getting out the door on Friday morning. 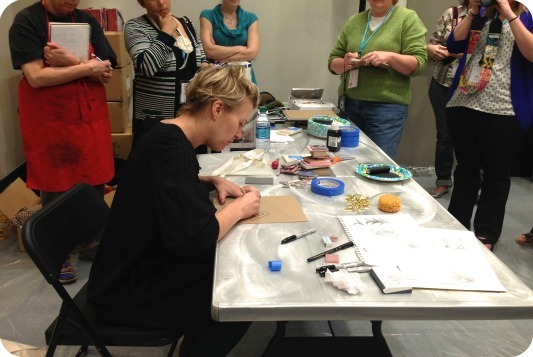 I was running a smidge late for my Textile Printing workshop with Lotta Jansdotter, but the class was all circled up watching her carve a stamp when I walked in, so my entrance wasn't disruptive. Phew. I love Lotta's fabric, so even though I'm not looking to pick up a new hobby and start designing fabric, this seemed like a great opportunity to try something new. I'm so glad I did. First of all, I loved that there wasn't a long list of supplies to bring to class. There was a $20 class fee, but there were all sorts of inks and brayers out in class, the whole room was covered in plastic, and we left with a kit containing tools, brushes, and stencils. We made stamps and stencils and added designs to muslin and printed fabric. It was neat to work with varying tools and try different methods. I had so much fun. Lotta definitely created an environment where you felt free to create and there was no wrong way or mistake. Rather just unique design features ;-) I loved seeing the other students' work. I mean, wow. I want them all to make fabric now. We'd be better off for it. My introverted self is kind of shy, but walking up to the other gals and talking about their stamps was so fun. After class I grabbed some lunch and then attended lectures in the afternoon. Anna Maria Horner talked about her design journey, there was a panel discussion on publishing your work in magazines, and Ellen Rushman presented data and commentary from her thesis on the modern quilt guilds. I got to do some shopping with Susan in the exhibit hall before we went to see Angela Walters talk about Machine Quilting Modern Quilts. She was hysterical, making jokes right and left, and I was bursting out laughing the whole time. I ran home to eat a quick bite. 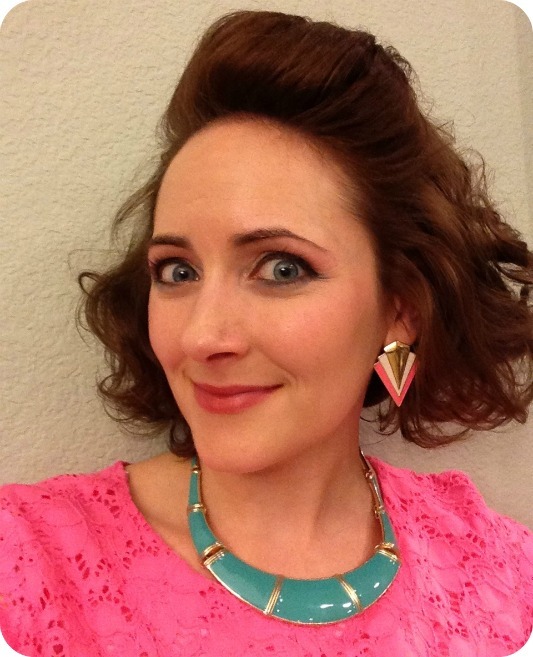 Then I threw on some pink spandex before spending an hour with the curling iron and a can of hairspray to create some giant 80s hair for the Babylock 80s dance party. The party was awesome. 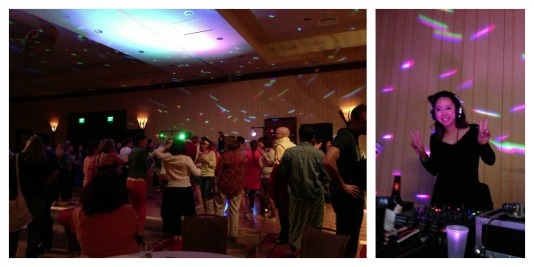 The Austin MQG's VP of Special Events, Christine, showed off her many talents by DJing the soirée. I got to hang out with the awesome Christi Fincher of Purple Daisies. I met some folks from the Vancouver MQG. 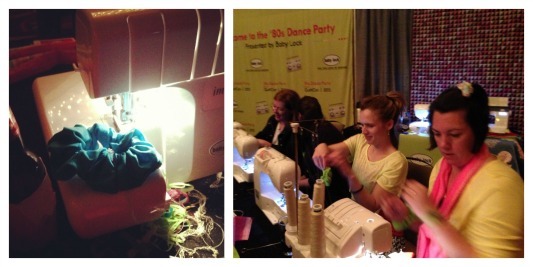 They also had sewing machines, sergers, and a longarm set up at the party so that folks could test drive the machines and make scrunchies. What?! That's right, you heard me. We made scrunchies at an 80s dance party. Thank you BabyLock. Pure genius. BabyLock also had the neatest elastic threading tool. I'll try to find it online and report back. I was super tired at the end of the night, but I helped Christine break the set up down before calling it a night. Days 3 and 4 are coming tomorrow! Thanks so much for the report! I was sad not to be able to attend - hopefully 2015. Congrats on the ribbon (well-deserved!). I'm the VP of the Central Jersey MQG and we usually have anywhere between 20 and 30 (usually closer to 30) members at meetings. That's just enough for our space, though, maybe even too many! Thanks for the report on your trip to Quilt Con. This is my first term as Secretary for the St. Louis Modern Quilt Guild. Last meeting we had about 40 people there, and that is about average for us, although we had our Madrona Road reveal at that meeting too. In December when we have our fundraiser, we can have 50-60 people show up for the fun. Luckily we have a large room at a large gym/city center to meet in. Congratulations on your ribbon! I love that mini! Wow sounds awesome, I especially love your 80s look, but I imagine you were too young to remember the 80s? Thanks for letting us "ride along" and congratulations on the recognition! Your ribbon coordinates with your quilt, which is especially charming. I feel exhausted just reading that, but glad you had fun, and congrats on the HM! Love the end result of all that hairspray! Congrats on the ribbon, thoroughly deserved. wonderful recap. i wish we could have met! Thanks for posting this. I didn't go to the dance party but love seeing everyone's pictures of it. Love that hair - and the scrunchies - I remember those, LOL! This is a wonderful post, Claire! 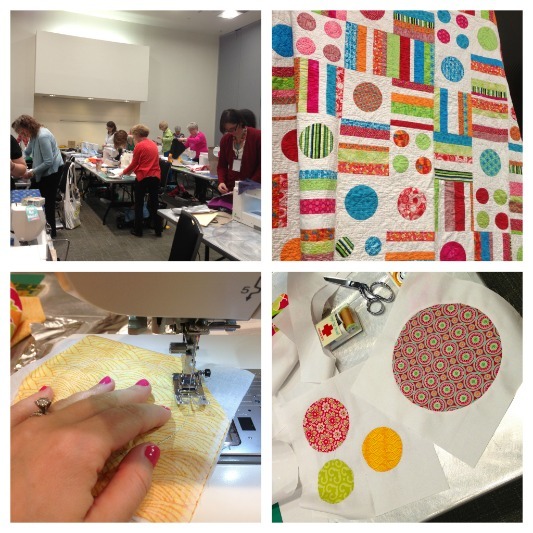 I just came across it since I'm taking Cheryl Arkison's Perfect Circles workshop tomorrow and I was searching for people's posts about her QuiltCon workshop. It was really wonderful to meet you and speak on the panel with you at QuiltCon. And, I agree, it's hard to find a meeting space for larger guilds! We had 67 people at our June Vancouver Modern Quilt Guild meeting and we're actively looking for a larger venue.